افرا, مهسا, مرادی, علی, پاکزاد, مهرداد. (777). بررسی جهت‌های اصلی تنش در شمال غرب ایران با استفاده از زمینلرزه‌های اصلی و پسلرزه‌های منطقه اهر- ورزقان. مجله ژئوفیزیک ایران, 10(1), 103-117. مهسا افرا; علی مرادی; مهرداد پاکزاد. "بررسی جهت‌های اصلی تنش در شمال غرب ایران با استفاده از زمینلرزه‌های اصلی و پسلرزه‌های منطقه اهر- ورزقان". 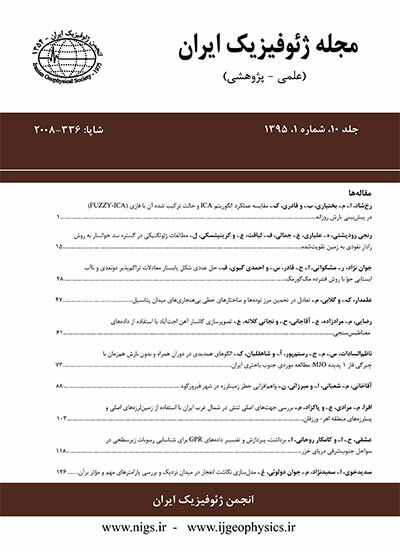 مجله ژئوفیزیک ایران, 10, 1, 777, 103-117. افرا, مهسا, مرادی, علی, پاکزاد, مهرداد. (777). 'بررسی جهت‌های اصلی تنش در شمال غرب ایران با استفاده از زمینلرزه‌های اصلی و پسلرزه‌های منطقه اهر- ورزقان', مجله ژئوفیزیک ایران, 10(1), pp. 103-117. افرا, مهسا, مرادی, علی, پاکزاد, مهرداد. بررسی جهت‌های اصلی تنش در شمال غرب ایران با استفاده از زمینلرزه‌های اصلی و پسلرزه‌های منطقه اهر- ورزقان. مجله ژئوفیزیک ایران, 777; 10(1): 103-117. شناخت جهت‌های اصلی تنش که تجمع آن عامل اصلی رویداد زمینلرزه محسوب می‌شود، سبب درک بهتر از نحوه حرکت گسل‌ها و سازوکارهای کانونی محتمل می‌شود. سازوکارهای کانونی زمینلرزه‌ها متأثر از هندسه گسل و جهت‌های تنش می‌باشند. لذا سازوکارهای کانونی زمینلرزه‌ها در یک منطقه منبع اطلاعاتی ارزشمندی برای بررسی میدان تنش در آن منطقه هستند. در این مطالعه، ابتدا با استفاده از برنامه ایزولا پارامترهای چشمه 15زمینلرزه در شمال غرب ایران که غالب آنها پسلرزه‌های رخداده در منطقه اهر-ورزقان بعد از زمینلرزهه‌ای سال 1391بودند، تعیین شد. سپس، به‌منظور بررسی وضعیت تنش در این ناحیه، از پارامترهای چشمه زمینلرزه‌های اصلی تعیین‌شده در این مطالعه و نیز رویدادهای اصلی برگرفته از کاتالوگ تانسور گشتاور مرکزوار جهانی استفاده کرده و با به‌کارگیری روش وارون‌سازی چندگانه، جهت‌های اصلی تنش محاسبه شد. در شمال غرب ایران در ناحیه بین دریاچه ارومیه تا تالش، آزیموت متوسط تنش‌های اصلی σ1و σ 3 به‌ترتیب 141و 50/2 درجه با نسبت تنش 0/6 محاسبه شد. برای منطقه اهر-ورزقان، با استفاده از سازوکارهای کانونی تعیین‌شده پسلرزه‌های این منطقه، آزیموت تنش‌های اصلی σ1وσ3به‌ترتیب 132/5و 42/4درجه با نسبت تنش 0/3 به‌دست آمد. اختلاف بین جهت‌های اصلی تنش در منطقه اهر- ورزقان در دو روش حدود 8درجه می‌باشد که به هم نزدیک است و نشان می‌دهد جهت‌های اصلی تنش به‌دست‌آمده حاصل از پسلرزه‌ها تفاوت زیادی با جهت‌های اصلی تنش حاصل از زمینلرزه‌های اصلی ندارد و تفاوت در میزان نسبت تنش‌ها حاکی از غالب بودن مؤلفه‌های معکوس در سازوکار پسلرزه‌های اهر- ورزقان در مقابل غالب بودن مؤلفه‌های امتدادلغز در زمینلرزه‌های اصلی منطقه می‌‌باشد. جهت حرکت امتدادلغز گسل‌های راستگرد که جهت آن‌ها شرقی- غربی یا شمال غربی- جنوب شرقی است با جهت تنش به‌دست‌آمده کاملاً توجیه‌پذیر است. Northwestern Iran is one of the seismically active regions with a high seismic risk in the world as confirmed by the historical background and instrumental earthquakes. The Ahar–Varzeghan double earthquakes of August 11th, 2012 with magnitudes higher than 6 are the examples of high seismic activities in this area. Our knowledge of stress state in a region is useful for a better understanding of different rupture mechanisms. The accumulation of stress is the main cause of earthquake, and its analysis is a crucial task considering the dense population of the region. The focal mechanism of an earthquake is one of the important source parameters which is practical for studying and analyzing the stress field. This parameter is affected by fault geometry and principal stress directions. One of the big advantages of the focal mechanism solutions is the ability to study the stress regime depp within the lithosphere. In this study, we determine the focal mechanisms of 15 earthquakes using the moment tensor inversion method of ISOLA program (Sokos and Zahradnik, 2008) in Ahar–Varzeghan region. This method was first proposed in order to calculate the source parameters at teleseismic distances (Kikuchi and Kanamori, 1991). It was developed later for regional and local distances by Zahradnik et al. (2005). In this method, Green’s functions are calculated by the discrete wavenumber method (Bouchon, 1981). The events used have moment magnitudes higher than 4 and encompass latitudes between 37° N and 40° N, and longitudes between 44° E and 49° E, during the period 2012–2014 for the focal mechanisms determined in this study and the period 1997–2014 for the Global Centroid Moment Tensor (GCMT) ones. We used the broadband stations of Iranian Seismological Center (IRSC), International Institute of Earthquake Engineering and Seismology (IIEES) and also stations of several other countries bordering northwestern of Iran. The focal mechanisms determined are often strike-slip and reverse which show a correspondence with the tectonic of this region. Then we analyze the stress state using these focal mechanisms and also by the focal mechanisms of other large and moderate earthquakes determined by GCMT in the region. We calculate the principal orientations of stresses by multiple inverse method that was originally proposed by Yamaji (2000). The method is a numerical technique to separate stresses from heterogeneous fault slip and focal mechanism data. Using the information of the acquired and GCMT focal mechanisms containing strike, dip and rake angles for the main shocks, we study the state of stress in the northwest of Iran. The result shows the average stress model with σ1 and σ 3 equal to 141 and 50.2 degrees with a stress ratio of 0.6 in the region between Urmia Lake and Talesh in the northwest of Iran. This stress ratio shows that most of the motions are strike-slip. Using focal mechanisms of aftershocks, the same values are respectively 132.5, 42.4 degrees and 0.3 in Ahar–Varzeghan region. The value 0.3 shows that the motions are reverse in this part of the northwest of Iran. The small difference between these values in the northwest of Iran and Ahar–Varzeghan region shows that the values of the acquired principal stress directions using aftershocks are close to those of the main shocks. The faults directions of right-lateral strike-slip motion are in accordance with the stress direction determined. زمانی قره‌چمنی، ب.، 1392الف، مدل زمینساخت فلات آذربایجان (شمال گسل تبریز و جنوب ارس): مجله علوم زمین، 22(87)، 41-50. زمانی قرهچمنی، ب.، 1392ب، بررسی وضعیت تنش در محدوده پهنه گسلی سیاه چشمه-خوی ( شمال باختر ایران ) و استفاده از روش تحلیل جدایش تنش‌ها در جدایش تنش‌های نوزمینساخت از تنشهای دیرین: فصلنامه علوم زمین، 23(89)، 75-88. Angelier, J., 1975, Sur l’analyse de measures recueillies dans des sites faill´es: l’utilit´e d’une confrontation entre les m´ethodes dynamiques et cin´ematiques: C. R. Acad. Sci. Paris, D, 281, 1805–1808. (Erratum: 1976. C.R. Acad. Sci. Paris, D, 283, 466). Angelier J., 1984, Tectonic analysis of fault slip data sets: J. Geophys. Res., 89, 5835– 5848. Angelier J., 1990, Inversion of field data in fault tectonics to obtain the regional stress—III. A new rapid direct inversion method by analytical means: Geophys. J. Int., 103, 363–376. Angelier J., 2002, Inversion of earthquake focal mechanisms to obtain the seismotectonic stress IV—A new method free of choice among nodal planes: Geophys. J. Int., 150, 588–609. Armijo, R., and Cisternas, A., 1978, Unprobleme inverse en microtectonique cassante: C. R. Acad. Sci. Paris, D, 287, 595–598. Bouchon M., 1981, A simple method to calculate Green’s function for elastic layered media: Bulletin of the Seismological Society of America, 71, 959–971. Carey, E., and Brunier, B., 1974, Analyse th´eorique et num´erique d’un mod`ele m´ecanique ´el´ementaire appliqu´e `a l’´etude d’une population de failles: C.R. Acad. Sci. Paris, D, 279, 891–894. Carey, E., 1976, Analyse numerique d’un modele m’ecanique el’ementaire appliqu’e a l’etude d’une population de failles: Calcul d’un tenseur moyen de contraintes ‘a partir des stries de glissement: Thesis, Universit’e de Paris Sud, 138 pp. Gephart J. W., and Forsyth, D. W., 1984, An improved method for determining the regional stress tensor using earthquake focal mechanism data: Application to the San Fernando earthquake sequence: J. Geophys. Res., 89, 9305–9320. Jackson J., Haines, J., and Holt, W., 1995, The accommodation of Arabia–Eurasia plate convergence in Iran: J. Geophys. Res., 100(15), 205–219. Kagan, Y. Y., 1991, 3-D rotation of double couple earthquake sources: Geophys. J. Int., 106(3), 709–716. Kikuchi M., and Kanamori, H., 1991, Inversion of complex body waves—ΙΙΙ: Bulletin of the Seismological Society of America, 81, 2335–2350. Masson F., Chery, J., Hatzfeld, D., Martinod, J., Vernant, P., Tavakoli, F., and GhaforyAshtiani, M., 2005, Seismic versus aseismic deformation in Iran inferred from earthquakes and geodetic data: Geophys. J. Int., 160, 217–226. McClusky, S., et al., 2000, Global positioning system constraints on plate kinematics and dynamics in the eastern Mediterranean and Caucasus: J. Geophys. Res., 105, 5695–5719. McGarr, A., and Gay, N. C., 1987, State of the stress in the earth’s crust: Annual Review of Earth and Planetary Science, 6, 405–436. McKenzie D. P., 1969, The relation between fault plane solutions for earthquakes and the directions of the principal stresses: Bulletin of the Seismological Society of America, 59, 591–601. McKenzie D. P., 1972, Active tectonics of the Mediterranean region: Geophys. J. Roy. Astr. Soc., 30, 109–185. Michael A. J., 1987, Use of focal mechanisms to determine stress: A control study: J. Geophys. Res., 92(B1), 357–368. Moradi, A., Hatzfeld, D., and Tatar, M., 2011, Microseismicity and seismotectonics of the North Tabriz fault (Iran): Tectonophysics, 506(1-4), 22–30. Otsubo M., Sato, K., and Yamaji, A., 2006, Computerized identification of stress tensors determined from heterogeneous fault-slip data by combining the multiple inverse method and k-means: J. Structural Geology, 28, 991–997. Otsubo M., Yamaji, A., and Kubo, A., 2008, Determination of stresses from heterogeneous focal mechanism data: An adaptation of the multiple inverse method: Tectonophysics, 457, 150–160. Reilinger, R. E., McClusky, S. C., and Souter, B. J., 1997, Preliminary estimates of plate convergence in the Caucasus collision zone from global positioning system measurements: Geophysical Reseach Letters, 24(14), 1815–1818. Sokos E., Zahradnic, J., 2008, ISOLA a Fortran code and a Matlab GUI to perform multiple-point source inversion of seismic data: Computers and Geoseiences, 34, 967–977. Sokos E., Zahradník, J., 2013, Evaluating centroid-moment-tensor uncertainty in the new version of ISOLA software: Seismological Research Letters, 84(4), 656–665. Vernant Ph., Nilforoushan, F., Hatzfeld, D., Abbassi, M. R., Vigny, C., Masson, F., Nankali, H., Martinod, J., Ashtiani, A., Bayer, R., Tavakoli, F., Chery, J., 2004, Present-day crustal deformation and plate kinematics in the Middle East constrained by GPS measurements in Iran and northern Oman: Geophys. J. Int., 157, 381–398. Yamaji A., Sato, K., 2006, Distances for the solutions of stress tensor inversion in relation to misfit angles that accompany the solutions: Geophys. J. Int., 167, 913–942. Yamaji A., Sato, K., Otsubo, M., 2011, Multiple Inverse Method Software Package, User's Guide. Zahradnik, J., Serpetsidaki, A., Sokos, E., Tselentis, G. A., 2005, Iterative deconvolution of regional waveforms and a double event interpretation of the 2003 Lefkada earthquake, Greece: Bulletin of the Seismological Society of America, 95 (1), 159–172. Zahradník, J., and S. Custódio, 2012, Moment tensor resolvability: Application to southwest Iberia: Bulletin of the Seismological Society of America, 102(3), 1235–1254. Zarifi, Z., Nilfouroushan, F., and Raeesi, M., 2014, Crustal stress map of Iran: Insight from seismic and geodetic computations: Pure Appl. Geophys., 171, 1219–1236.